A Mobile Future for Emergency Services? A global shift in the world’s economies, technologies and societies is driving unprecedented change, not just in our personal lives, but also in the critical communications and emergency services sectors. Most prominently is the new Emergency Services Network (ESN). Despite being impacted by delays, the network promises to harness the power of technology for improved productivity and efficiency, ultimately enabling the emergency services to protect and save more lives, reduce crime and create even safer communities. However, the most important tools remain unchanged – that is, robust communication and relevant and accurate information. Indeed, the ability to provide up-to-date information, to the right resources, at the right time, over a secure and reliable network is critical in delivering emergency services to keep the public safe. As such, these foundations continue to be the priorities throughout the transition to ESN and beyond. Nevertheless, ESN has the potential to facilitate an abundance of innovative new mobile technologies for the benefit of the emergency services and those they serve. Other innovations are also developing separate to ESN, albeit with still huge operational benefit to these organisations. To help map and understand some of these technologies, we asked the question: How is mobile technology changing our lives and how might this be used to support our emergency services? Read on for the findings. Too early to talk about 5G? For those not aware, 5G represents the current aspirations of the telecommunications sector. For example, to deliver gigabit mobile connectivity and thereby regain its position as a key area of innovation in the global digital economy. Although ESN on 4G technology has not yet been delivered, 5G’s capabilities and benefits to the public and private sectors over the coming 5 years should not be dismissed. It may however impact decision-making on where extremely valuable budgets are allocated. Another innovative – albeit slightly controversial – technology, facial recognition and the use of artificial intelligence, enables the services to trawl public social media accounts, as well as emergency services databases. Why would this benefit? Essentially, this advancement could generate a significant increase in detection rates for criminal activity and suspect identification, as well as helping to locate missing persons. This could save many hours of detective work and hone in on criminals more quickly, as well as supporting vulnerable people in the community. Several police forces have already been trialling facial recognition capabilities over the last few years. For instance, the Metropolitan Police has conducted a number of trials to see if facial searching and matching technology can be employed effectively in crowded public places. Likewise, ahead of last year’s UEFA Champions League Final in Cardiff, South Wales Police used facial recognition technology to identify potential troublemakers - be they ticket touts, hooligans or terrorists. Overall, facial matching systems have improved significantly in recent times and will reach acceptable quality for operational use, although that remains to be demonstrated. It is expected that privacy issues will need to be legislated for before widespread operational use can be deployed. On similar thread, the biometrics concept has emerged. Indeed, West Yorkshire Police has recently started using this technology – a mobile fingerprinting system - that enables the force to check the identity of an unknown person in less than a minute. Fingerprints collected on the street will be compared against the 12 million records contained in national criminal and immigration fingerprint databases and, if a match is found, will return the individual’s name, date of birth and other identifying information. It should be noted that officers will only resort to fingerprint scanning if they cannot identify an individual by other means, testimony to the fact that this system is mainly geared towards suspected criminals. Nevertheless, it could also be used to identify someone who is unconscious and needs medical treatment or for identifying casualties at the scene. Looking ahead, the government’s long-awaited Biometric Strategy is due to be published in June 2018 – watch this space. The final area of technology under research relates to driverless innovation – that is, the use of robotics designed to travel between destinations without a human operator. There are many offshoots in this broad area of development – we look at a few below. The Transport Secretary Chris Grayling has indicated that driverless cars could be legal on the roads of Britain by as early as 2021. The World Economic Forum estimates that self-driving cars would reduce accidents by 70 per cent, improve fuel efficiency by 20 per cent and save approximately 1.2 billion hours of driving time over a period of 10 years. At its most basic level the European Parliament announced that all new cars must be able to automatically notify emergency vehicles in the case of a crash by 2018. This in itself should save time and potentially lives. And that’s just the start. New technology that’s set to hit showrooms in 2018 includes systems that can take over the task of driving in traffic queues, pre-collision warning systems that detect vehicles, cyclists and pedestrians, and key fob or smartphone-controlled parking. At the same time as we’re fitting increasingly sophisticated driver assistance solutions in cars, the number of accidents appears to be going down. Figures cited by the SMMT suggest that road accident rates have dropped by 10 per cent over the last five years. Could this be an indicator of positive influence? Furthermore, a patent from Ford submitted in 2016 revealed ideas for autonomous police cars detailing all the ways in which an autonomous police car could help catch law-breaking drivers. The patent gives multiple examples of how police traffic can catch human drivers. For example, it proposes a sophisticated speed detection system, through which it can catch the offending cars and deliver a warning or a fine. Whilst this may be several years away, it certainly shows the direction in which automotive companies are going. 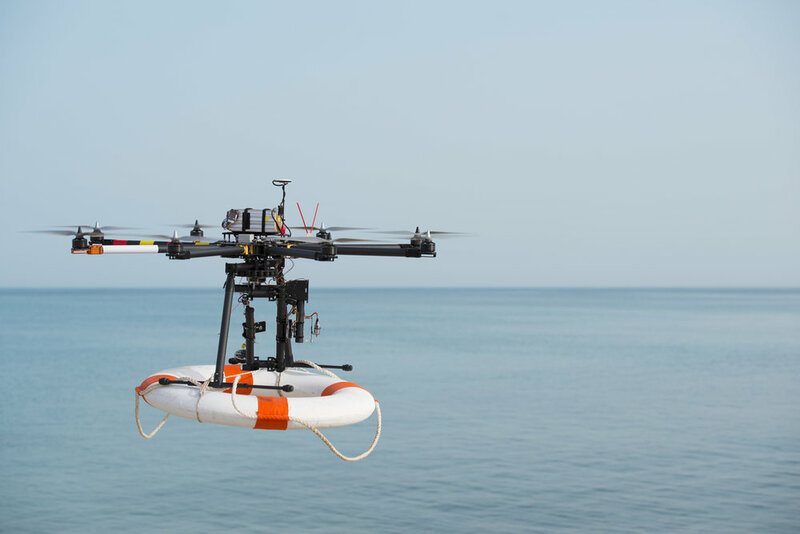 The companies showed how emergency response teams from could immediately deploy drone fleets in a remote disaster area. In addition to the use cases mentioned above, this technology can assist in other use cases including health and remote surgery applications and assisted driving or autonomous vehicles. How will these technologies impact on the shift to ESN? Whilst progress towards implementation of ESN has been delayed significantly, it’s important that the industry continues striving for new developments and the best innovation. As such, we’re involved in the horizon scan for new technologies and opportunities to enable the provision of these technologies for the emergency services. As we transition through the hybrid and towards a fully transitioned ESN, we will continue working alongside critical suppliers, as well as the emergency services, to ensure a seamless changeover. If you’d like to keep up to date on our latest ESN insights, register for our newsletter at hello@apdcomms.com.